Many employers still do not enter into written contracts with their employees. A recent case from British Columbia illustrates why this is a bad idea. The parties ended up in Court, where a Judge had to piece together testimony and the facts at the time the contract was made, to determine the nature of contract (see James v. The Hollypark Organization Inc.). In 2011, entrepreneur Sam Dhillon signed a franchise agreement with Marriott, to operate the Hollypark hotel under the Marriott brand. However, Marriott had strict experiential and training requirements for general managers (GMs) of Marriott hotels. Hollypark, through Mr. Dhillon, hired Ms. Gail James to assist with the opening of the hotel, and to work as the GM. Ms. James had the requisite Marriott–approved training and experience. Mr. Dhillon did not. Hollypark was slated to open in April 2013, but ended up opening in July 2013. Hollypark hired Ms. James in early spring 2012, and terminated her in August 2013. Ms. James alleged that Hollypark hired her as the GM, for a fixed-term of 1 year, starting from Hollypark’s opening date. If so, at the time she was terminated, she would have had approximately 47 weeks remaining in her fixed–term contract. Mr. Dhillon’s position was that Ms. James did not have a fixed-term contract, and that he hired her to assist on an as–needed basis. If Ms. James was right, Hollypark was liable for the 47 weeks remaining on her contract, less any amount she could reasonably be expected to earn from comparable alternative employment. (Terminated employees are expected to minimize or mitigate the impact of job loss by taking reasonable steps to secure comparable employment). The Judge confirmed that fixed–term employment contracts can be wholly or partially oral. However, for a fixed–term contract to be valid, the intention of the parties must be clearly expressed or necessarily implied from the evidence. With an oral contract courts have greater flexibility in the nature of the evidence they can admit. This is because—and this is key—absent a written contract, courts do not have written words, which are a key interpretive tool, to understand the contract. The nature of Marriott franchises: The Judge accepted oral and written evidence proffered by Ms. James to establish Marriott’s requirements of franchisees. Marriott would not approve the opening of the hotel unless a GM with Marriott–approved training and experience was in place for the first year of operations. Ms. James had it; Mr. Dhillon did not. His likely options were to hire someone like Ms. James or cede control to a management company. The Judge found that given Mr. Dhillon’s preference for retaining management within his family, he was more likely to have picked the former option, which was also more cost–effective. Additionally, the Judge accepted Ms. James’ evidence that Mr. Dhillon selected a one–year contract to give him enough time to acquire the requisite Marriott training and experience. Ms. James relocated from Kelowna, where she had deeps roots, to Vernon where the hotel was located, and committed to a one–year lease. The Judge found that it was very unlikely that she would have done all of this, had she not been assured of a position of some permanence. Ms. James submitted as evidence a proposed remuneration plan that had been provided to Mr. Dhillon. The plan was consistent with a one–year fixed-term contract, as it covered a one-year period from 1 April 2013, which was Hollypark’s planned opening date. Mr. Dhillon advised other employees that Ms. James would be their coach for Marriott-approved training. The Judge found that as the training was expected to extend well into 2014, this was consistent with the one–year, fixed–term contract alleged by Ms. James. Mr. Dhillon instructed Ms. James to apply to the City of Vernon’s Tourism Advisory Commission, for a one–year appointment starting June 2013. This suggested he expected her to be around well into 2014. Mr. Dhillon ordered 500 business cards for Ms. James, with the title of GM. Although some of the above evidence was not conclusive, overall, the Judge found the evidence and Ms. James’ testimony consistent with a one–year fixed–term contract. Hollypark was liable to pay Ms. James her salary plus 4% vacation pay for the 47 weeks left on her contract when Hollypark terminated her. With a deduction for two weeks of severance that Hollypark had already paid, Ms. James was entitled to $53,485.72, plus vacation pay. The Judge also awarded her some special damages for furniture storage costs incurred because Hollypark terminated her. 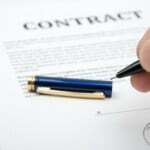 Written contracts will help to ensure that all parties have the same understanding of the agreement. This will reduce the likelihood of litigation. If the parties do progress to litigation, it will likely be easier and quicker for the courts to interpret the contract. This will reduce litigation costs and time. This benefits everyone, including the winner. Although the Court may order the loser to pay the winner’s legal costs, the loser is not usually required to pay 100% of these costs, so the winner has to absorb the difference. For further reading on the drawbacks of unwritten contracts, see The Pitfalls of Unwritten Contracts – Part 1.